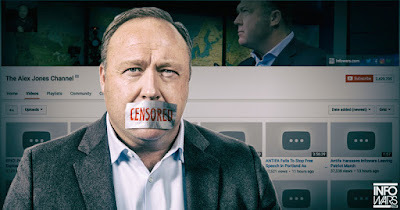 The Solemn Compact: From the Editor: Alex Jones and Censorship. From the Editor: Alex Jones and Censorship. With the recent knee-jerk fervor over talk radio host Alex Jones being de-platformed from multiple mainstream websites across the internet (YouTube, Facebook, Spotify, Apple, and Google just to name a few), I thought it prudent to touch upon the concept of censorship in the modern age. Specifically, how many corporations are acting as de facto agents of left-leaning ideology to control the natural flow of information on the internet. Silencing your enemy only serves to bolster their claims of oppression and disenfranchisement. Why? Because censoring your opposition reflects a condition of fear. If American history has taught us anything, it is that sound ideas stand the test of time. Ideas will either endure upon their own merits, or they will be forgotten. When one set of ideas are censored in the service of protecting another set of ideas, this only proves that the former are legitimate, substantive, and inspiring. The most effective way to let your adversary fail is by providing them with an open platform to spread their fruitless message. Faulty ideas inherently prove to be their own demise. Obviously, Jones’ message wasn’t so defective after all, thereby making large corporations like Google and Apple fearful of his claims. For many years, Jones warned his listeners that corporations would seek to silence him permanently and limit his ability to speak freely. By de-platforming him, these very corporations are proving Jones right. The left-leaning globalist agenda is quite real… and corporations will do anything to preserve it. They’re afraid of men like Alex Jones, and they have every right to be. Our nation was founded upon the principle that citizens have the right to a free and open dialogue with their peers (in fact, the First Amendment protects it). Even if said ideas are inaccurate or potentially offensive, they deserve the same protections under the law as any other speech. Censorship stands in opposition to that very principle set forth by our founders. Accordingly, the concept of censorship is as un-American as socialism; it just doesn’t work in a free republic. All citizens have the same right to express their ideas, even those I personally disagree with. By preserving the right to free speech for your rival, you ultimately preserve your own right to free speech as well. Why We Need the Electoral College.